NY Interiors > Blog > Think Spring! Spring is a great time to freshen up our home designs. It’s also a fabulous source of color inspiration all year long. Rooms that remind us of spring are all about freshness and color. 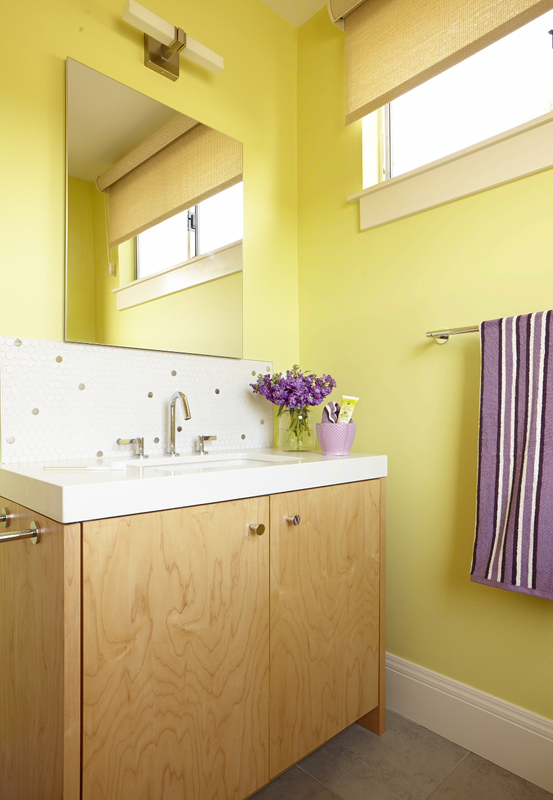 I designed this kids’ bathroom using Benjamin Moore Bath & Spa paint in Hibiscus. The tile backsplash is a playful combination of white ceramic and stainless steel penny tiles. The custom cabinetry is maple. Small bursts of color in the accents add energy. If you want to make a bright and sunny statement with your decor; paint, pillows, bedding, artwork and rugs are a good place to start. Just a few touches is all it takes. Give your home a dose of freshness: Think Spring!